Jamie was reported missing on September 12. Police Scotland is seeking the assistance of the media and the public in trying to trace a 31 years-old man missing from Kilmarnock. Jamie English was last seen around 10am on Monday, September 11, in James Little Street, Kilmarnock. He hasn’t been seen or heard from since and his family is growing increasingly concerned. He was reported missing to police on Tuesday, September 12. Jamie is white, around 5 ft. 11 inches in height, with a slim build, brown eyes, light brown hair and normally clean shaven. When last seen, he was wearing shorts, a black padded jacket and black Adidas trainers. He has tattoos on his arms, the one on his left arm depicts roses with the name Harrison. 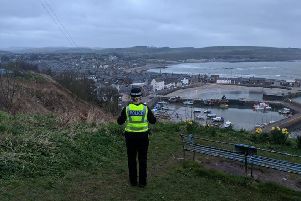 Extensive enquiries are underway to locate Jamie with officers checking the Aberdeen area as Jamie has worked there in the past. However, attempts to locate him have so far proved unsuccessful. Officers are gathering relevant CCTV for review and linking in with transport organisations in an effort to obtain any additional information which could assist in locating Jamie. Anyone with information is asked to call officers at Kilmarnock Police Station via 101, quoting reference number 1225 of Tuesday, September 12.